Pipe gates are staples of farms and ranches. They also are used in urban settings to provide a secure entry to a house and yard, especially on larger lots and estates. They may be plain or fancy, with electrical or automatic openers, or very simple barriers fastened with latches or chains. The style of a pipe gate should suit the style of a house. A simple gate is fine for a house set back from a road or street but is out of place in a suburban development. Build a simple pipe entrance gate with three pieces of pipe. Measure the gate opening with a tape measure and cut one piece with a welder's cutting torch to the width of the opening. Cut a shorter piece of the same-size pipe, about 36 inches high. Cut a third piece, of smaller pipe, about two-thirds the length of the first pipe. Weld the long pipe and short pipe in an L configuration, then weld the third pipe diagonally between the two pipes as a brace. Make hinges by welding short vertical pieces of reinforcing bar on the long pipe, bent in an L shape with one bar facing up, the other down, and welding small pipes to the gate post for the bars to fit in. Use pipes to fit the rebar. Set the gate before welding the final pin in place. Make a latch by welding a piece of pipe with a slot cut in it to the top of the long gate pipe and a piece of rebar fitting inside. Bend the rebar to make a handle in the slot. Drill a hole in the gate post for the rebar to slide into. An option is to weld a chain to the top of the long gate bar, to wrap around the gate post and fasten with a lock. Build a framed pipe gate by welding a rectangular frame of pipe to fit the opening. Miter corners or "cope" them by cutting cups in the tops and bottoms of the vertical side posts for the top and bottom posts to fit into. Use sturdy pipe for the frame -- 3- or 4-inch diameter. Cut pieces of smaller pipe for inside bracing. These braces can run horizontally across the frame, vertically inside the frame or any combination; some gates have a vertical center post with horizontal braces on either side. The number of braces needed will depend on the length of the gate. Weld strap hinges or other gate hinges to the upright post on one end of the gate and to the gate post. Buy hinges with removable pins to make mounting the gate easier. Make a latch or buy a latch with a catch on the gate post side and a pin on the gate. Another option is to fasten with a chain welded to the gate or post. 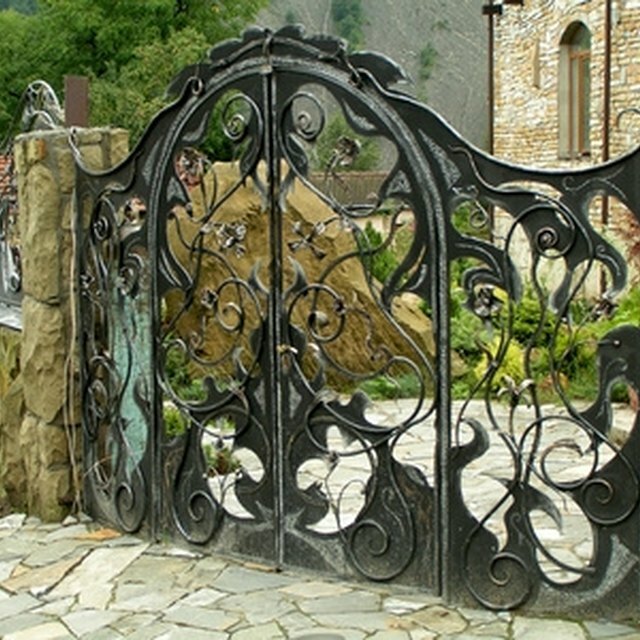 Create an ornate pipe gate by welding a basic frame of rectangular pipe to fit the opening. Drill holes through the top and bottom rails, evenly spaced. Insert rods or small pipes upright through the openings, extending above the top rail. Use round or square pipes for these uprights. They also can extend below the bottom rail. Weld the uprights in place, making sure the tops are either level or deliberately slanted to a center peak. Then weld caps on the tops of each upright. Buy spear-type caps from a welding or building supply store for a neater appearance. Mount the gate on substantial but decorative hinges bought from a welding or fence shop, or a building supply store. Add a decorative latch from a similar store. Paint the gate with weather-resistant metal paint.